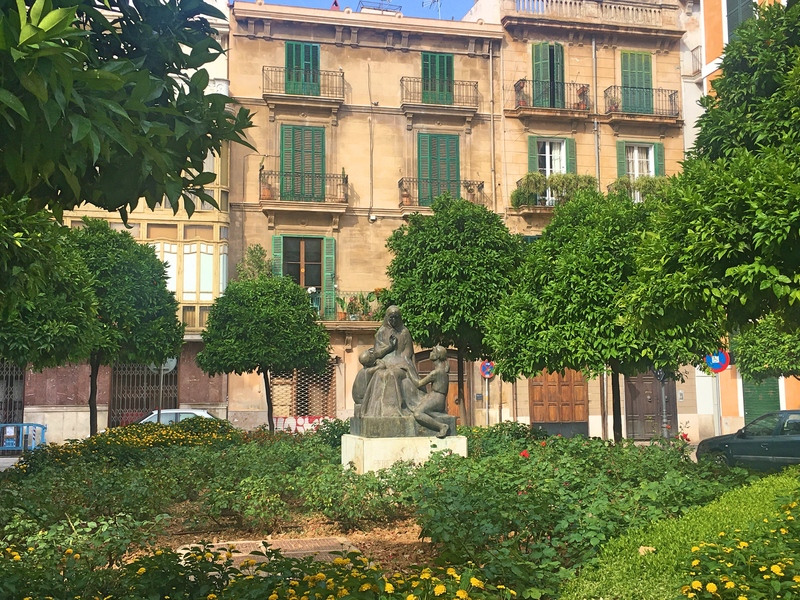 After two stops in smaller towns in the northern part of Mallorca it was time to hit Palma, the capital and biggest city of the Balearic Islands. I was here once in the 1970s when I was in the Navy but the only thing I remember – literally the only thing – was going on shore leave, getting drunk, and puking into the sea. My hope was that this trip would produce better memories. And it did. 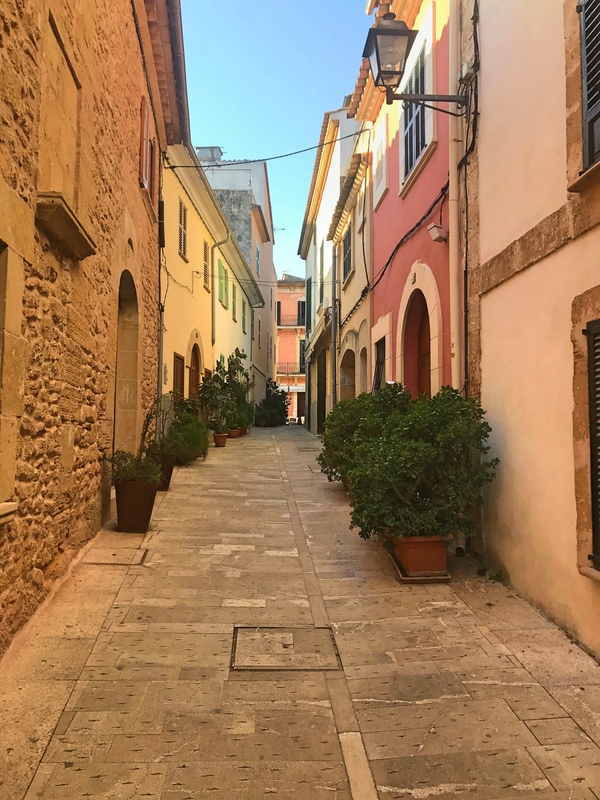 Palma is a city of 400,000 people, somewhat isolated due its location on an island, but culturally it plays in the big leagues. The big deal in the city – a real “Wow!” moment – is the massive cathedral. On top of that, though, the city has some great art museums highlighting Picasso & Miró, among others, and a pretty nice beach. A great place to spend four days. 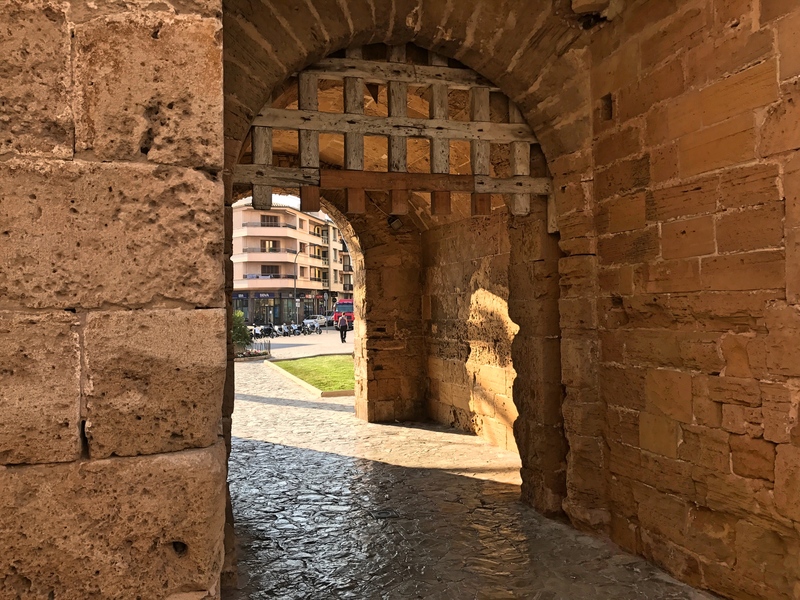 Palma’s recorded history starts with a Roman settlement in the second century BC. 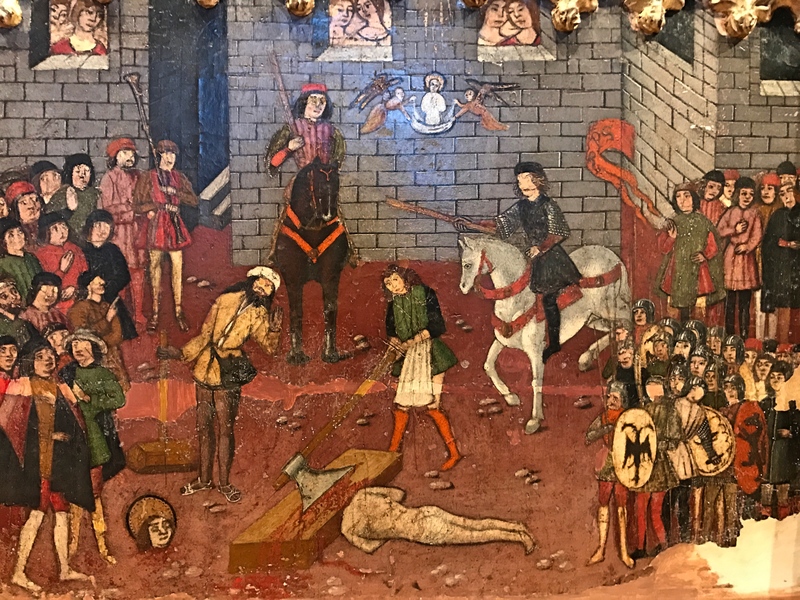 When the western Roman empire collapsed in the fifth century the city was first conquered by Germanic Vandals before they were in turn conquered by the Byzantine Eastern Romans. 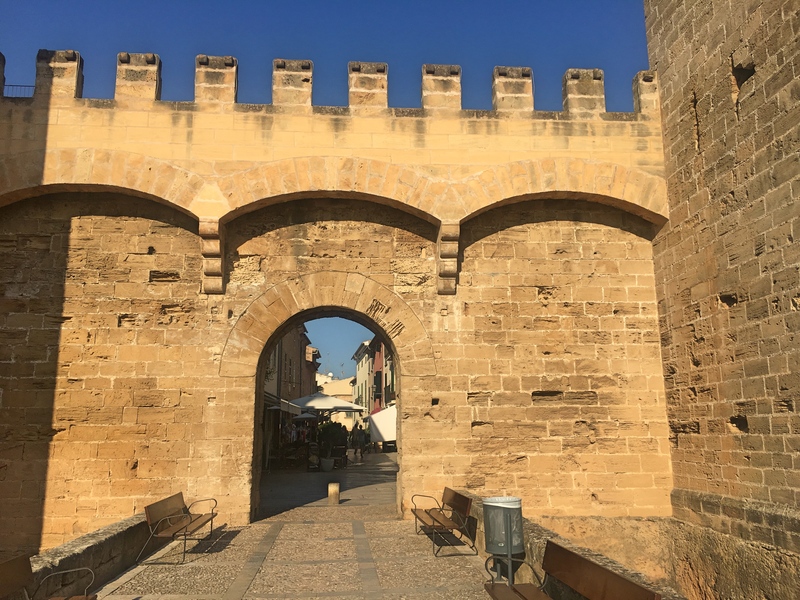 They were kicked out when the Moors conquered the Balearics in 902 and the islands remained a Muslim colony until James I of Aragon defeated them in 1229 and returned the island to Christian control. 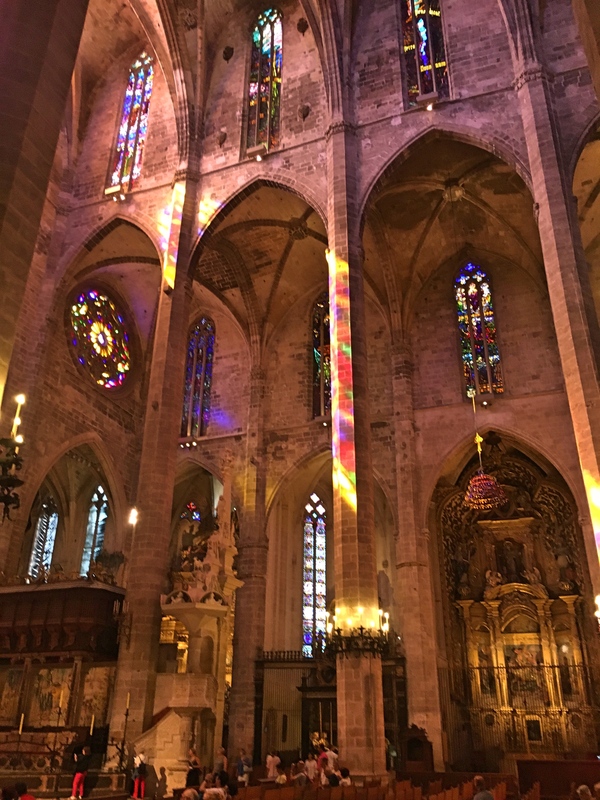 The amazing site in Palma today is the Cathedral. 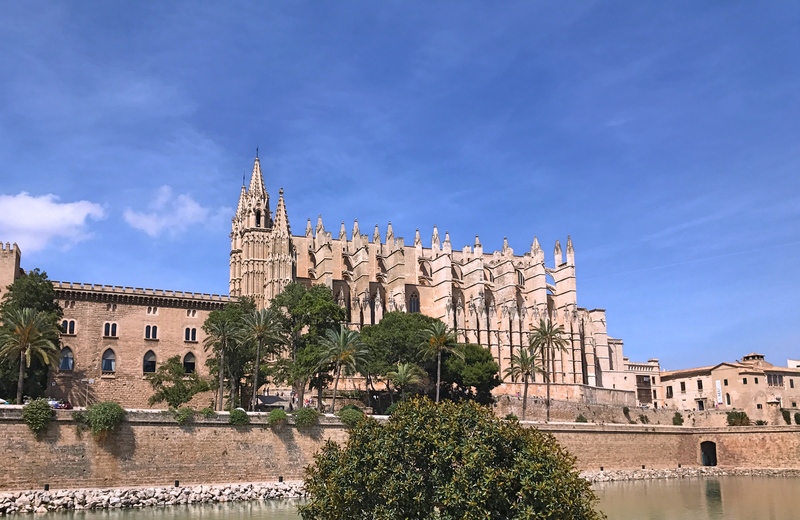 As one moves around Palma, through the Old City and especially along the coast, you can’t miss it: the Cathedral is immense. To give you just a sense of the scale, the ceiling of the cathedral’s nave, the central isle, is 144 feet high, fully one-third higher than Notre Dame’s 108 foot nave. The cathedral was started immediately on James I’s victory in 1229 in gratitude to Mary for saving James’s fleet from being destroyed in a storm. They built it on the site of what had been Palma’s main mosque, which wasn’t unusual for the time. Apparently, though, one of the oddities of this is that when kneeling at the alter now you’re facing Mecca rather than Jerusalem. Huh. 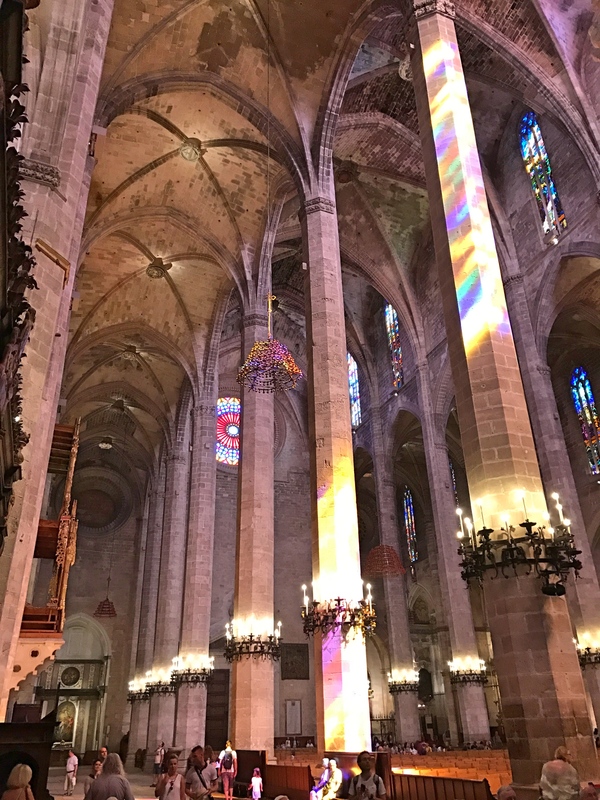 Besides just the scale, though, a big part of the cathedral’s “wow” factor is that in 1901 Barcelona’s Antoni Gaudí (of La Sagrada Familia fame) was invited to take over a restoration project then underway. Over 13 years he made a number of cosmetic changes but he then abandoned the project in 1914, apparently in a dispute with the contractor. Part of the fun in walking around the cathedral was identifying which of the items in it were his; some were obvious, some less so. 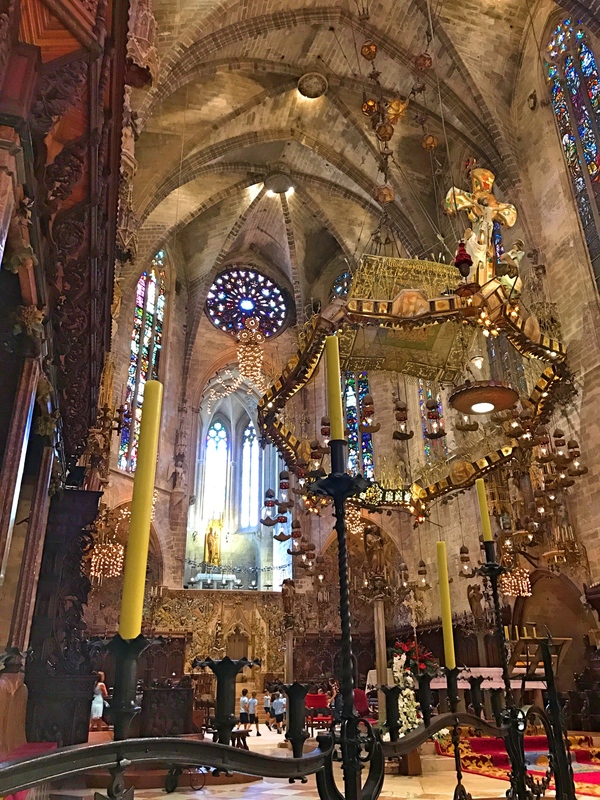 Lots of Gaudí seen here, in particular the very strange baldachin hanging over the high altar. 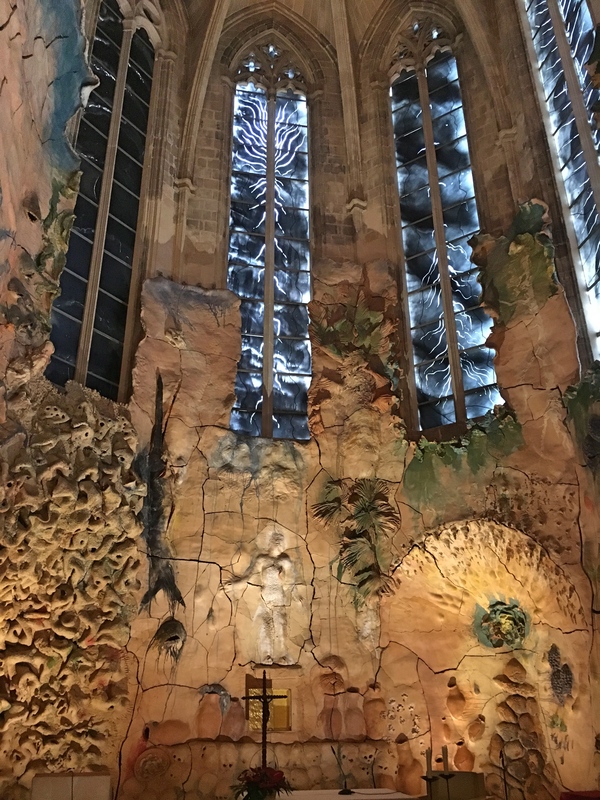 Note that on the back wall below the rose window is a light fixture in the shape of … an octopus. 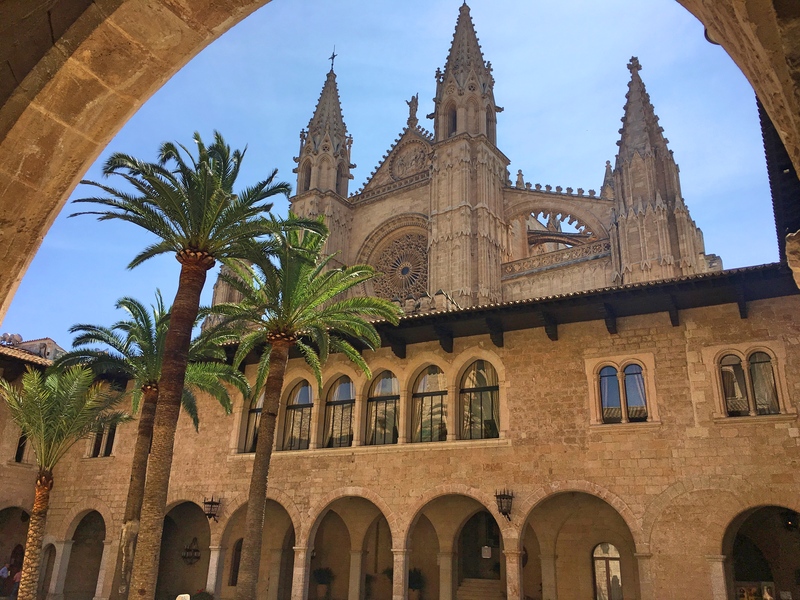 Today Palma is a major tourist destination and in the summer the airport here is one of the busiest in Europe; in 2016 fully 26 million people passed through the airport. So there must be more to the city than just the spectacular Cathedral. And there is. 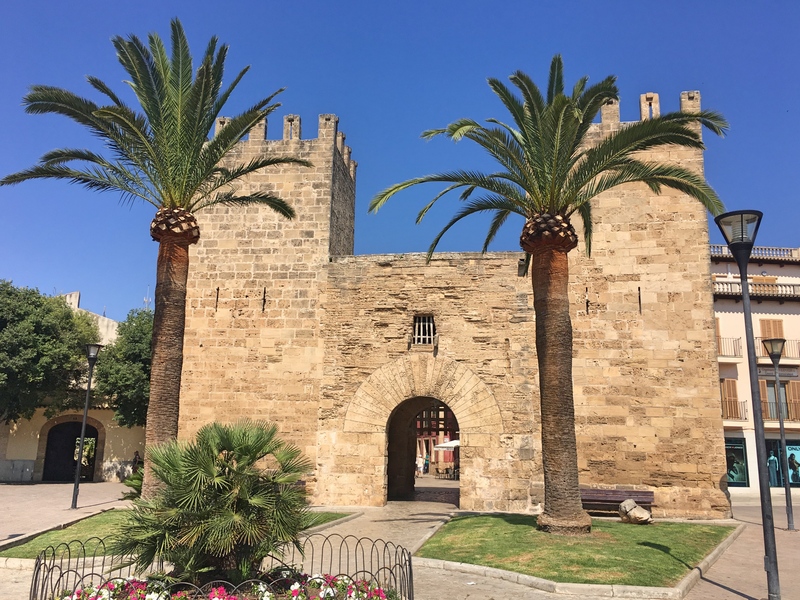 Es Baluard is a great contemporary art museum built into the shell of the city’s Renaissance-era walls with great views over the port and Cathedral. 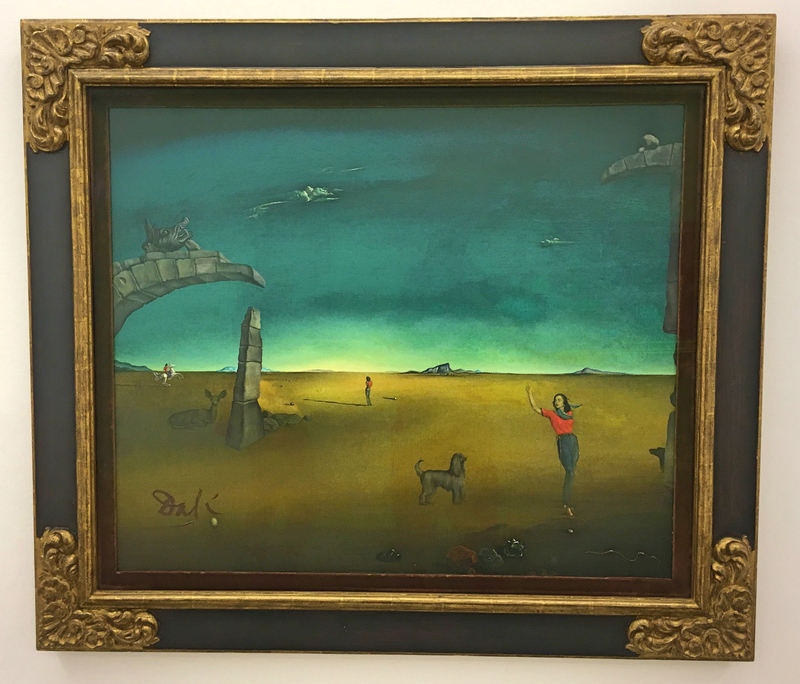 The collection of Picasso, Miró, and Barceló – a contemporary Mallorcan artist – was well worth an hour or two. And still there was more. 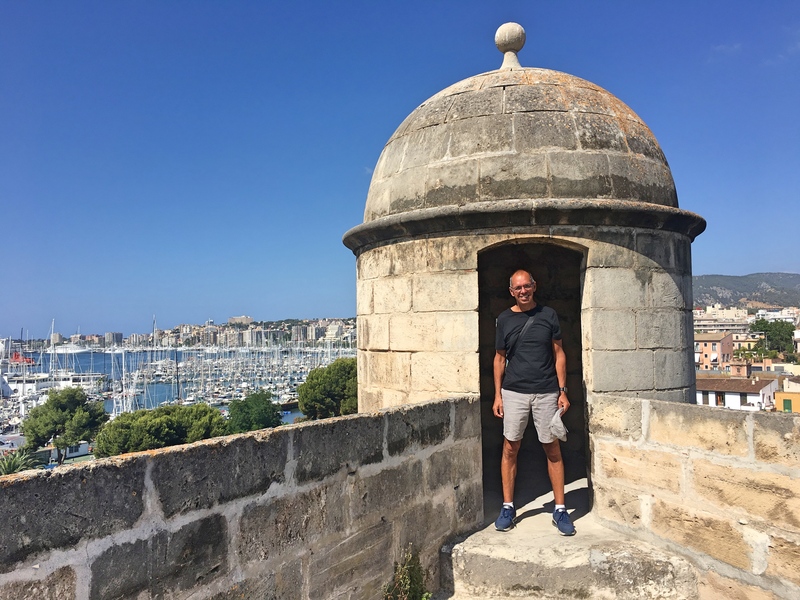 The Palace of Almudaina – once the home of Mallorcan monarchs and today still an official residence of the King of Spain – is worth a tour. 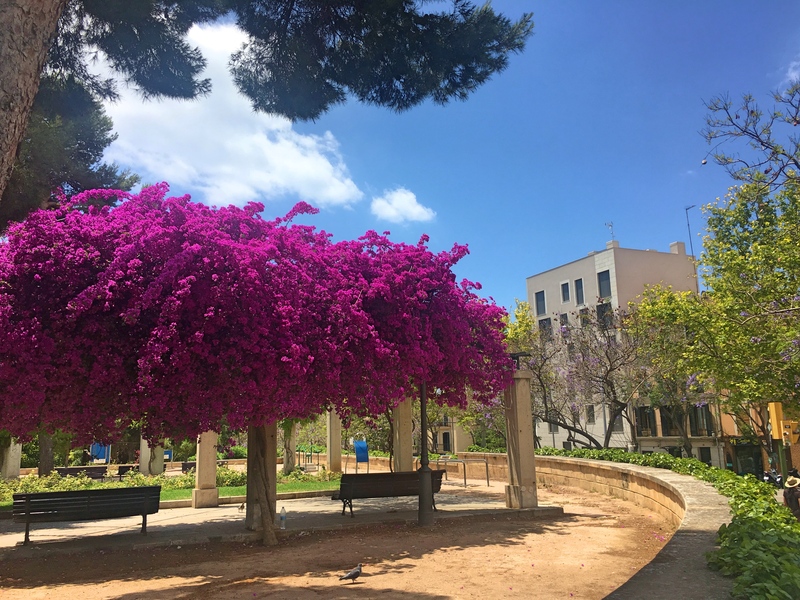 And two museums that grew from the holdings of a fabulously wealthy Palma family – the March Palace and the Museum of the Foundation of Juan March – hold more modern, mostly Spanish, art. In addition the Palace holds a spectacular but somewhat weird 18th century Neopolitan nativity scene. 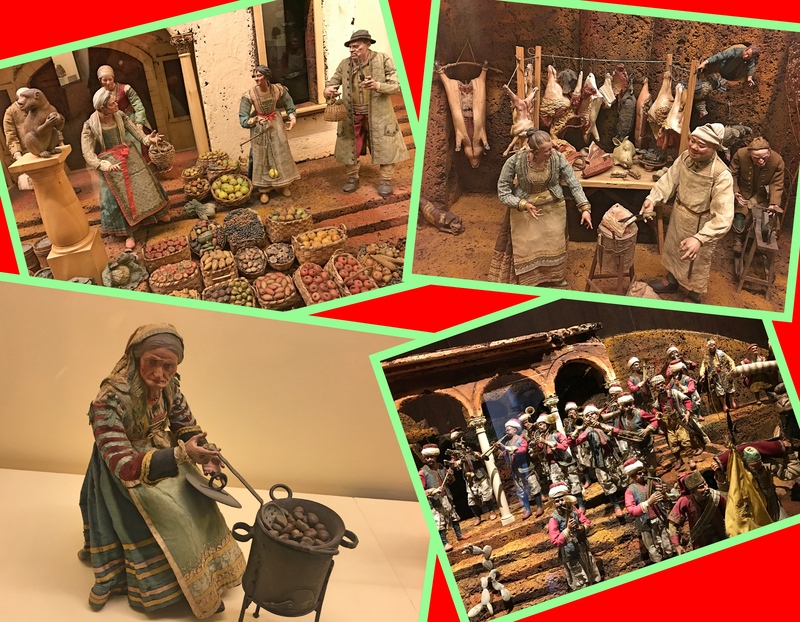 You see much, much smaller versions of these nativity scenes in Naples’ old town but this one was a lot bigger, the sort of thing royalty would commission (which is how this one came to be). 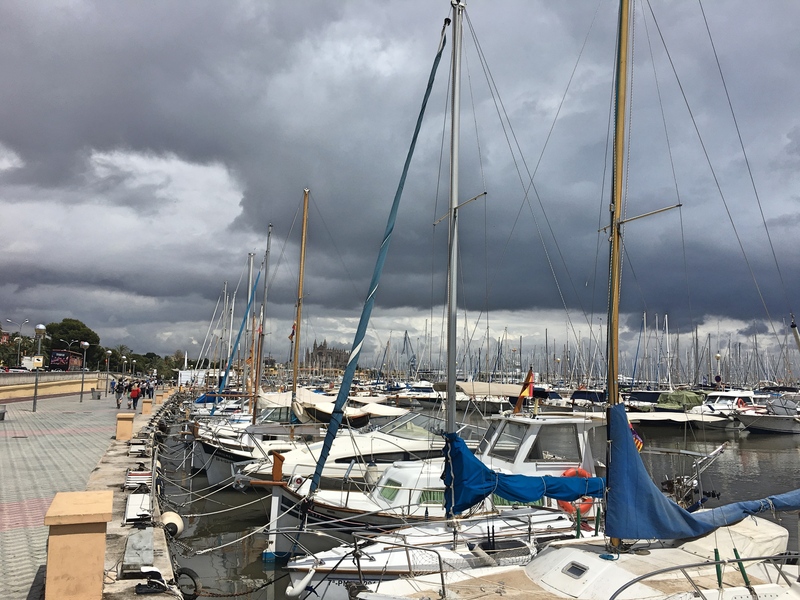 We had a great experience in Palma, and this time I didn’t act like a drunken sailor. 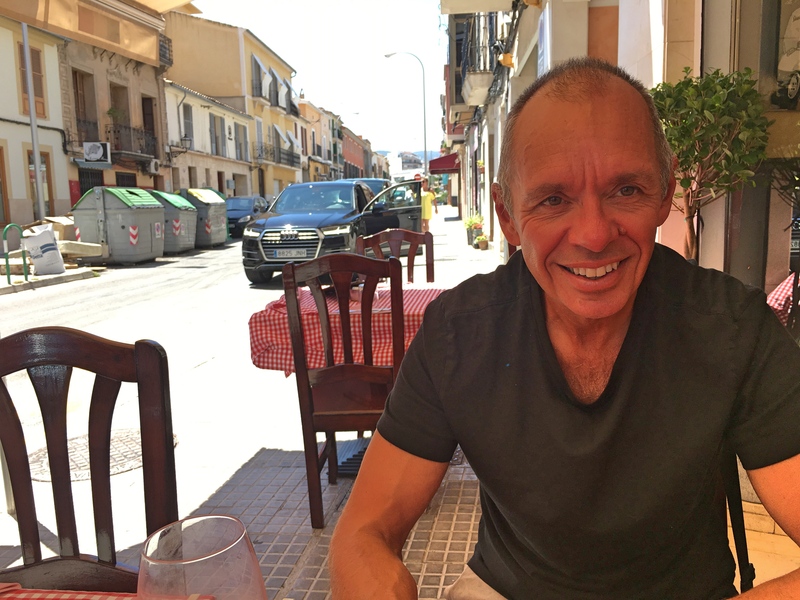 In addition to all the cultural stuff and the kind of shopping we have to do when we’re finally in a bigger city for a few days I got in a couple runs, some time just relaxing in a couple of the city’s great little cafés, and even some time on the beach. 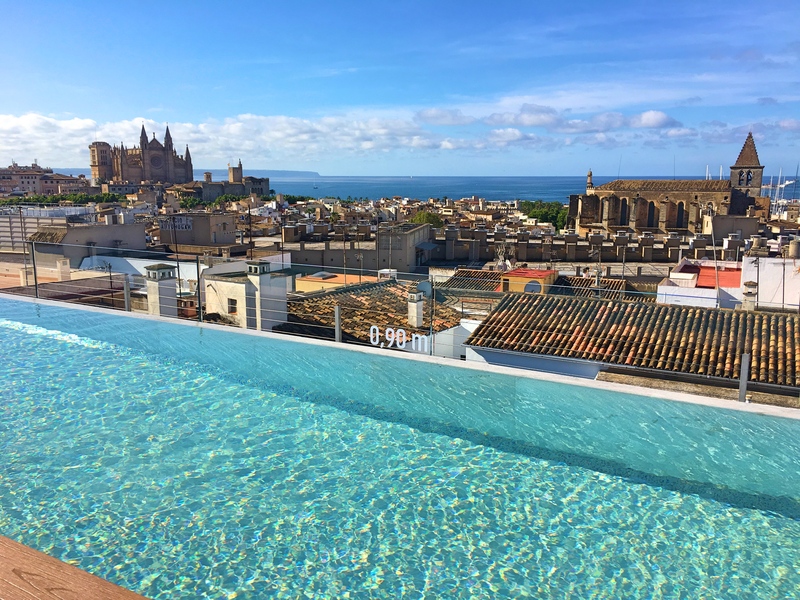 There’s nothing not to like about Palma. The modern art museum Es Baluard is built into the old city walls. Here I am up on the roof doing a really bad job of standing guard. 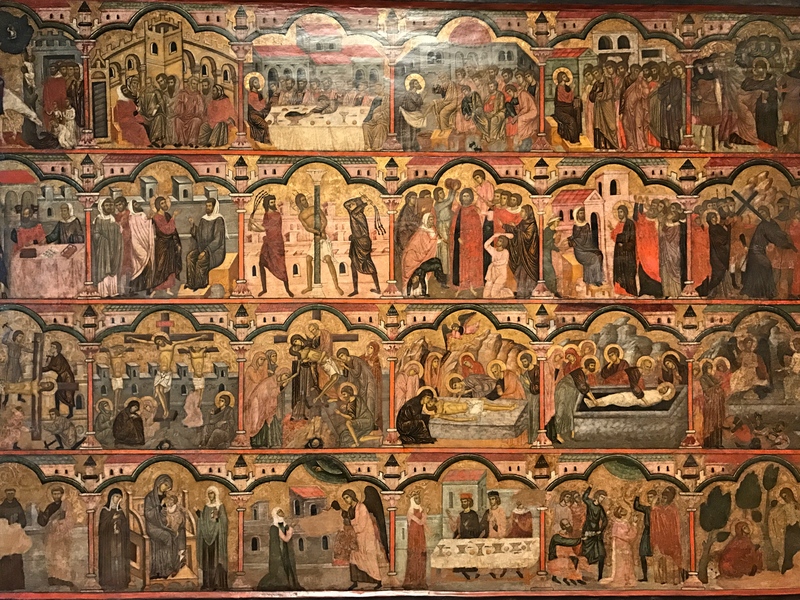 A late 13th century altarpiece beautifully restored in the Cathedral’s museum. Lonely Planet called it “mind-boggling” which might be a little overstated but it was pretty impressive. 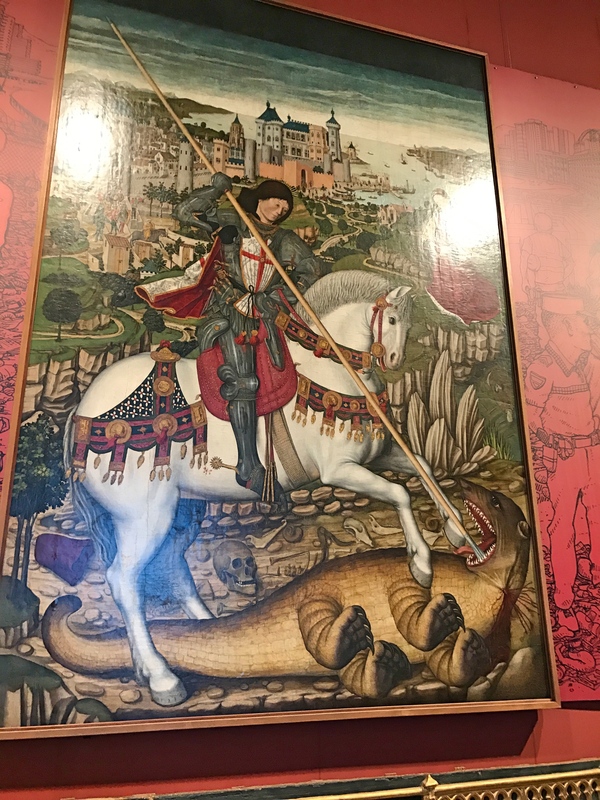 Unfortunately right below it was this gory piece showing the decapitation of St. George. Notice his head laying over in the lower left corner. We spend a lot of time in big cities, but we like to get into some of these places that few people have ever heard of, too. And it’s remarkable just how many cute towns and small cities there are in the world. Alcúdia is one more. The street from our hotel up to the main square. 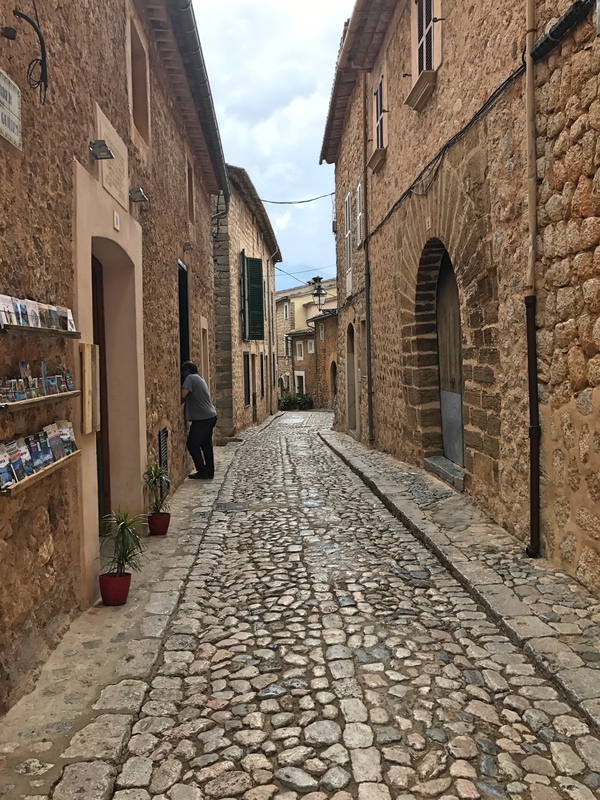 Alcúdia is a small town, but the streets and main square were beautiful. 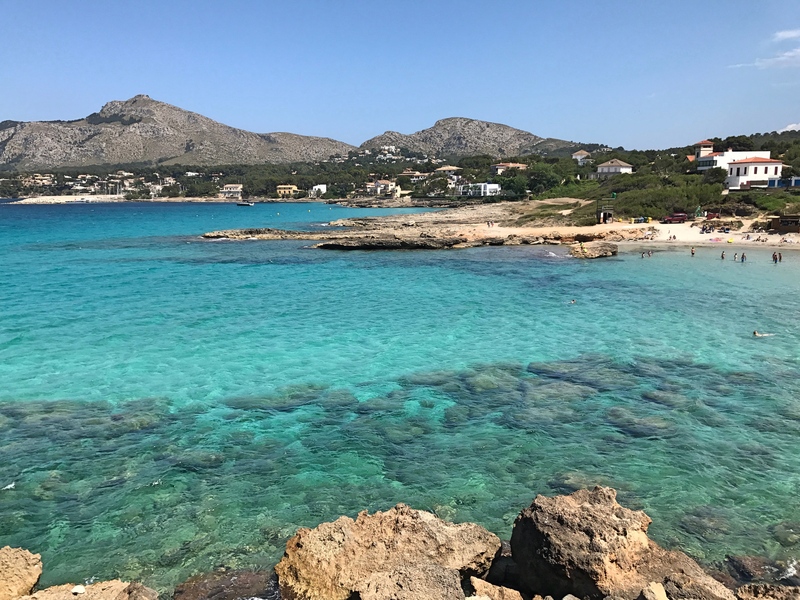 If the reason to go to Sóller was the hiking, the reason to go to Alcúdia is for the beaches. This is, after all, a Mediterranean island, so you’d expect there to be some nice beaches. The town itself isn’t on a beach; instead the town is at the foot of a peninsula sticking out from the island, midway between the beaches on either side of the peninsula. The beaches themselves are both a nice little walk away while all the restaurants and bars you need are inside the old walled town. We were amused when we got to our hotel, a tiny little boutique place that had recently been renovated with an obviously loving hand. The guy at the front desk was describing the two beach options on either side of the peninsula and described one as a little “downscale.” The way he said it was though he all but told us straight out “You’re gay; you don’t want to go to that one.” Not that any of the beaches were at all gay; the place is far too small for that. Just that one was a little classier, a little quieter, a little less family oriented. Not surprisingly, his recommendation was pretty much spot on. And that’s what we did for our two-plus days in Alcúdia, go to the beach. I’d go before Mark and typically stay later (Indian v. German-Irish), and then we’d find an Indian restaurant (the other kind of Indian) for lunch. 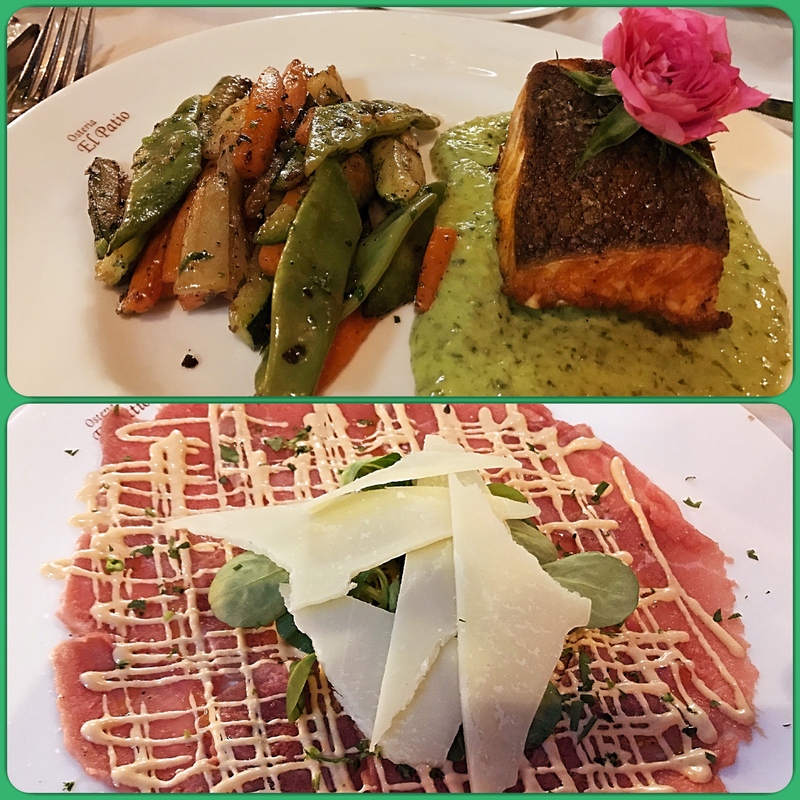 Dinner in the cute old town surrounded by medieval walls, sleep, get up, and go back to the beach. Pretty soon some youngish adult guy goes into the building and comes down dragging a little kid, maybe five or six years old, just screaming. He’d been tossing stuff from his second- or third-floor window and Dad was going to make him apologize, except he was humiliated and screaming and sobbing too much to say anything. Strange experience. So that’s Alcúdia. Oh, and one way you can tell you’re in Spain? We’re used to the fact that they eat late here and usually we love it that way. But here on Mallorca, at least, breakfast is pushed back too. In Sóller breakfast didn’t start until 8:30, a lot later than we’re used to. Here in Alcúdia it was even worse: 9:00 AM. Yikes – I’m pretty hungry by then. The managers explained that they’d started earlier when they first opened and just no one came down before 9:00 AM. Strange world. Next stop, Palma, the big city. 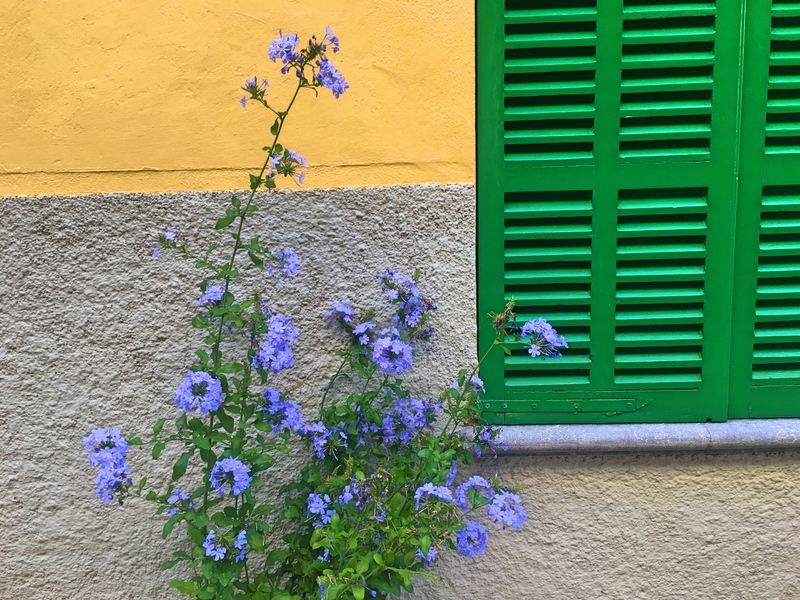 We’ve been to nearly all the major islands in the western Mediterranean and we’re making a pretty good dent in the Greek and Turkish islands of the eastern Mediterranean. 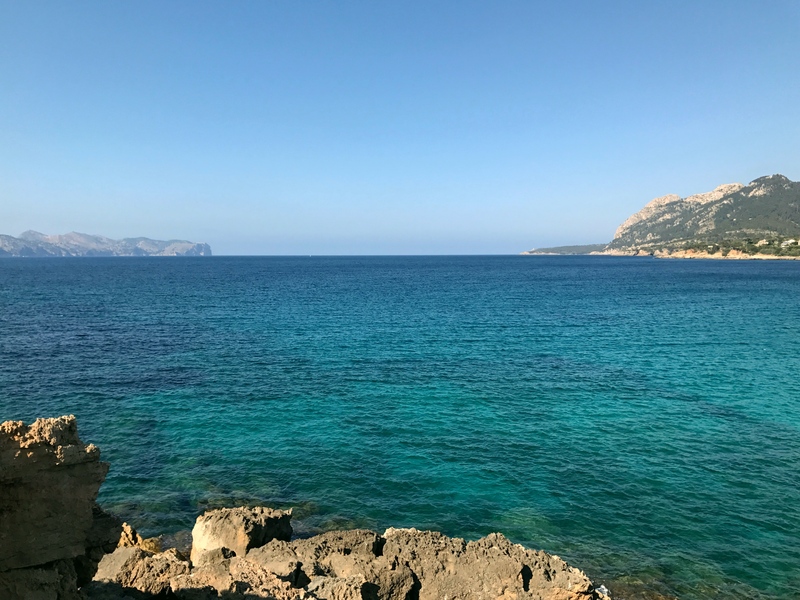 The biggest gap for us has been the Balearic Islands off of Spain so when we decided to visit Dan & Lorraine in Barcelona we figured we would then explore Mallorca, the biggest of the island group. 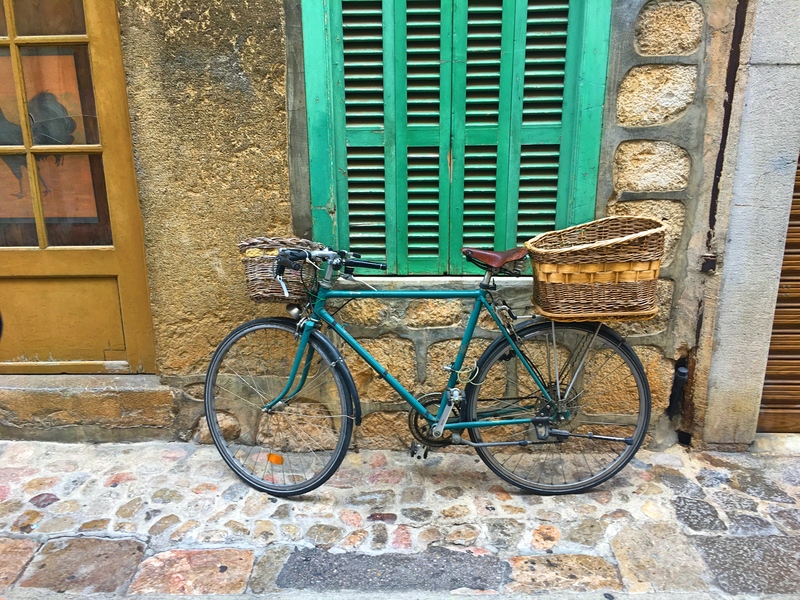 Here we are, then, on the northwest coast of Mallorca for four days. Getting here was fun. 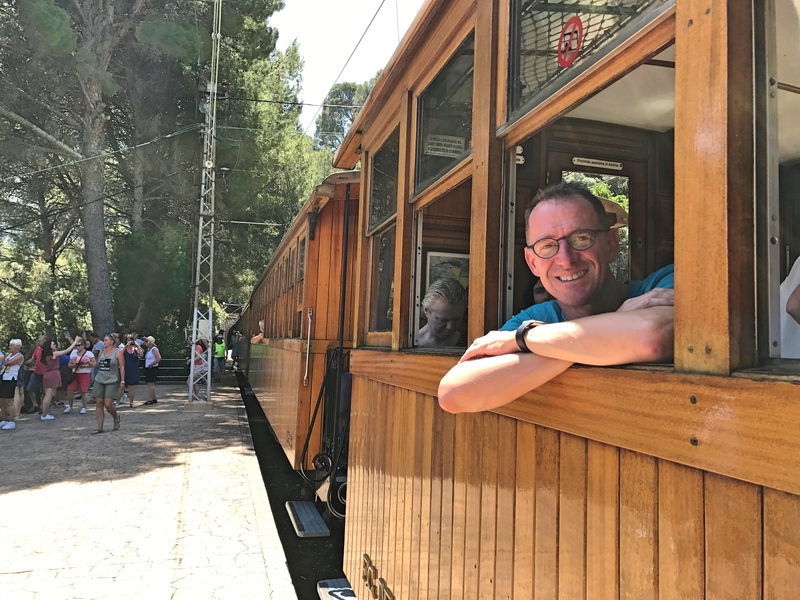 While the flight from Barcelona to Palma (the main city on the island) was pretty ordinary, you get to Sóller via a classic old train from Palma. And once you get there there’s an even more classic old tram that takes you the two miles down to the port area. So moving around was a lot of fun. 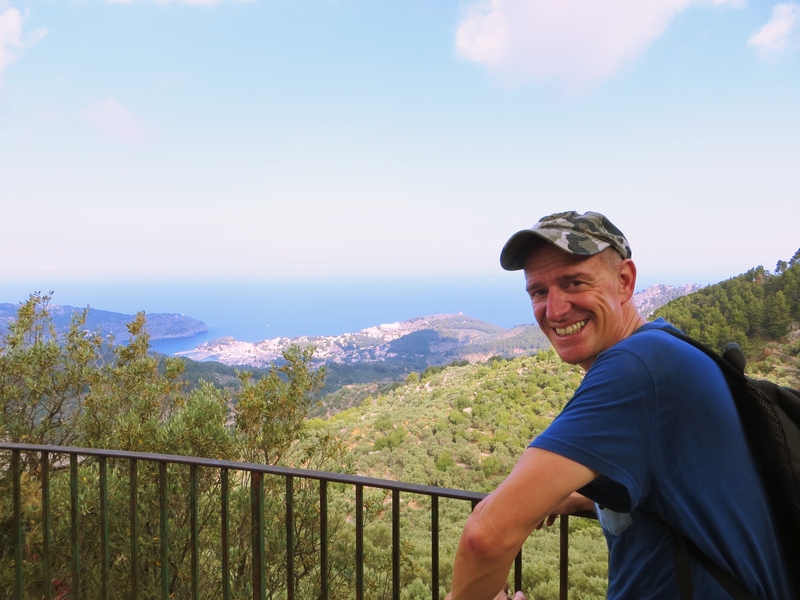 And speaking of moving around… Sóller is a tourist area and for us the big attraction was some spectacular mountain hiking. 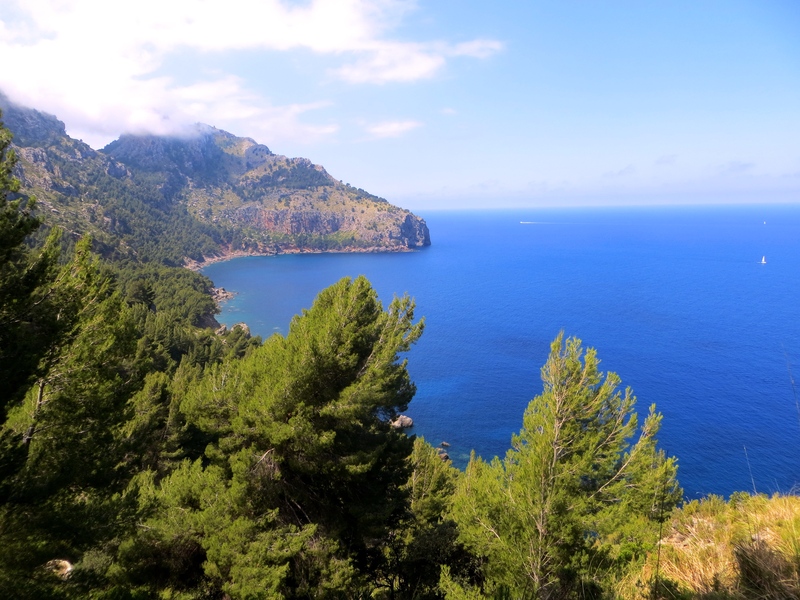 The Sierra de Tramuntana is a mountain range that runs along the western coast of Mallorca. Named a UNESCO World Heritage Site in 2011 because of its beauty and cultural importance, the area is studded with great hiking trails of which we did a couple during our relatively short stay. The first was a maybe three-and-a-half hours to the even littler town of Deiá. We were pretty excited when our hotel manager told us about the hike. Deiá, you see, is something of an artist colony, with the great British poet and writer Robert Graves living and ultimately dying there. More to our tastes, the manager told us that Andrew Lloyd Weber has a place there and one night his wife, enjoying a drink with friends, was surprised to see Weber and his one-time musical partner Tim Rice show up and start singing Beatles songs. 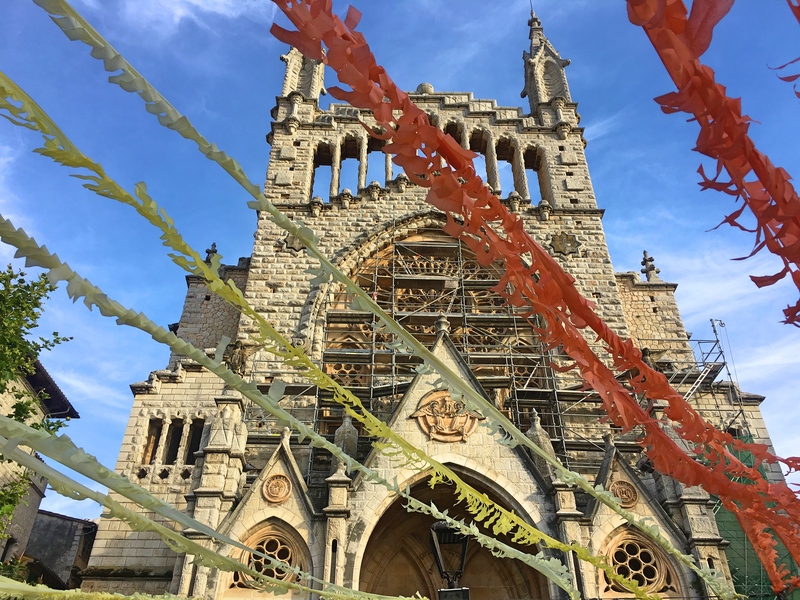 Our Deiá experience wasn’t quite so eventful. It was a beautiful and challenging hike, but no Andrew Lloyd Weber. 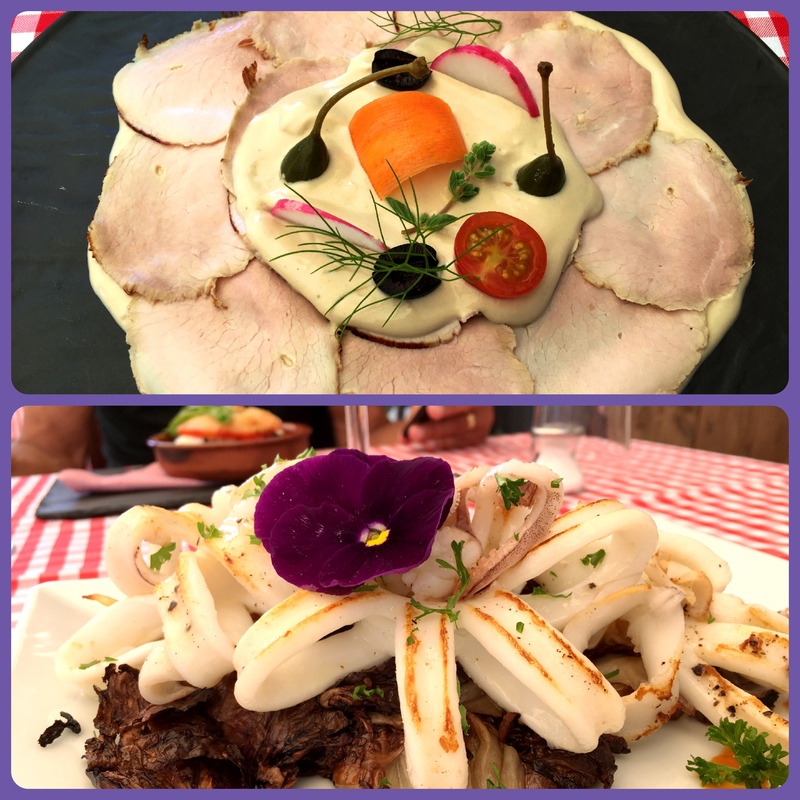 We did have a great lunch, though, on the terrace of a lovely Italian restaurant and then one of us walked back, up and over the mountains again. The next day was mostly a rest day, in part due to a bit of on-and-off rain but mostly because I was worn out. Our last day, though, was another great hike, this time nearly five hours to a little town of Tuent. Part of the attraction of doing this hike was that, at well over four hours, there was no prospect of just turning around and walking back. 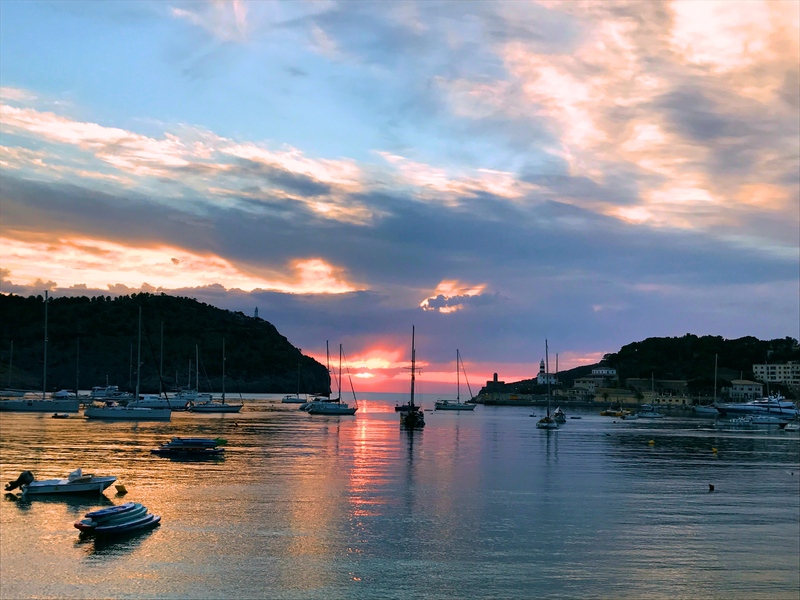 Instead once a day at 4:45 PM a boat pulls up to the little pier at Tuent to whisk you back to Porto de Sóller, the little port town near Sóller proper. Sounded fun. 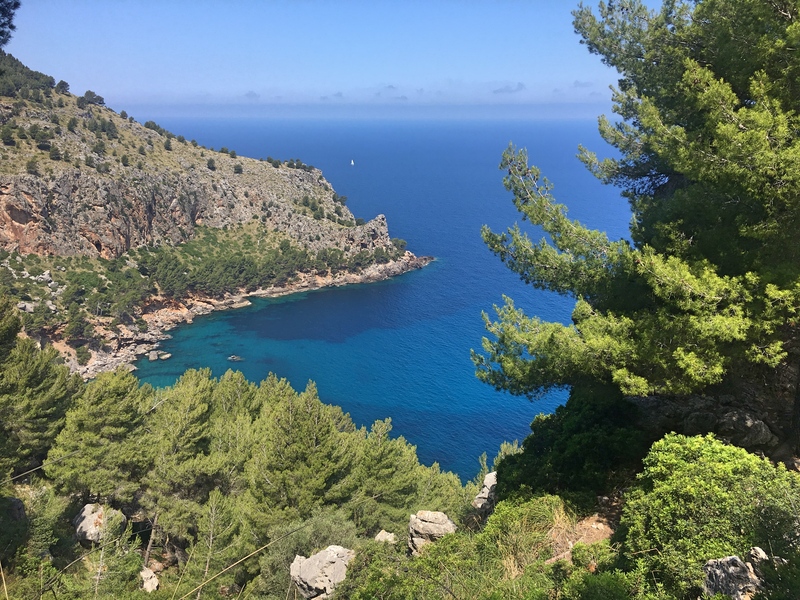 Along the hike to Deiá and the early part of the hike to Tuent Mark and I would note that while the terrain was beautiful and the sea was, well, the Mediterranean (you need say no more), this was no Capri. Then at one point on the trail to Tuent *bam! * there it was, just a stunning view of the mountains and the sea and the trail and yes, it was just about as good as Capri. So we finished the hike just loving the natural beauty with one looming question: what kind of lunch would we find in Tuent. The stunning trail on the way to Tuent. Now we understood why it’s a UNESCO site! A woman at our hotel in Sóller had described the hike and boat ride to us and explained that there was one restaurant there. Just one. My expectations were low since if there is only one it probably aims for a pretty low standard. I couldn’t have been more wrong. It was a beautiful place with a great terrace shaded by huge trees. Good food, good wine, lots of water, and a beautiful setting. You couldn’t really ask for much more. In other words a great lunch, but with one exception: a group of some 30-or-so French hikers who’d been a challenge to get around on the trail. There were just so many of them, walking fairly slowly, and all of the with those silly walking poles that just take up too much room on the trail. That was OK, but they got to the restaurant just about the same time as we did (after we’d made a wrong turn and detoured by maybe 30 or 40 minutes) and were just obnoxiously loud. There were a number of other guests but somehow the French figured they had a right to chant and sing and just be noisy. Next time I hear someone complain about loud Americans I’ll have a story to tell them. The boat ride from Tuent to Port de Sóller. Have I mentioned that I love Mediterranean waters? After an otherwise great lunch (and they did eventually quiet down more or less) we had time to kill before the boat ride, so we just hung around reading. And then we finished it all with a beautiful little boat ride along the coast up to Port de Sóller. Close to perfect! 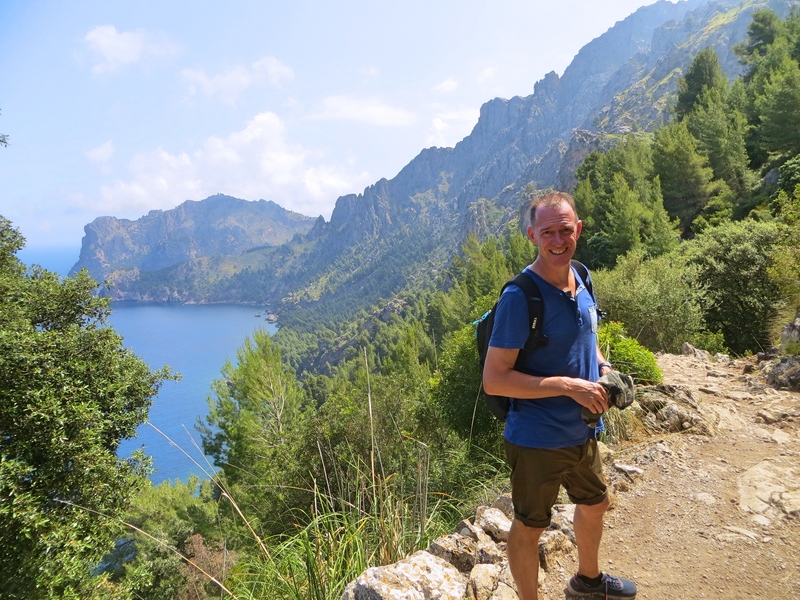 Besides hiking and food there was plenty to enjoy about Sóller. It’s mostly just a cute little town with cute little streets and a cute central plaza. But it has one of the most interesting train stations you’ll ever see anywhere. 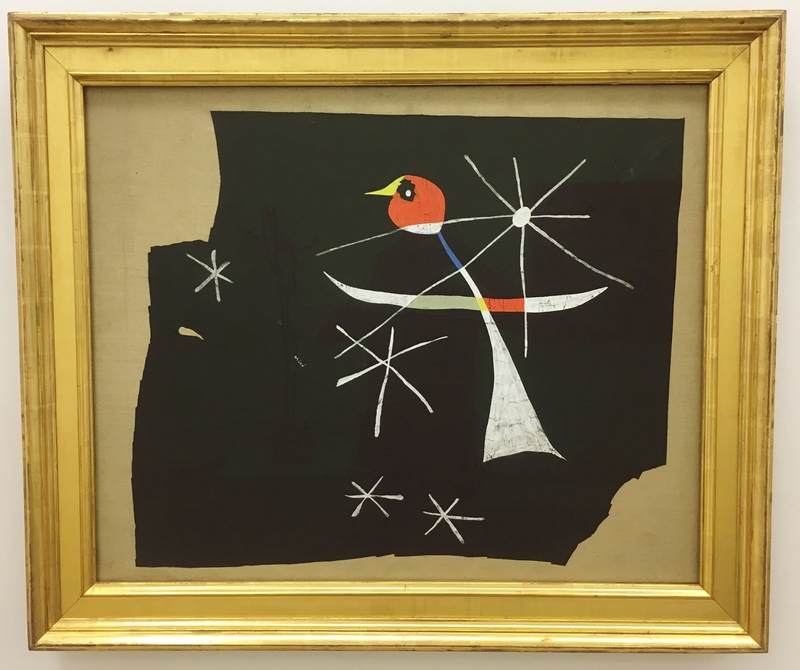 Two giants of Spanish art, you see, Joan Miró and Pablo Picasso, both spent time in the area; Miró in particular spent a lot of time here. 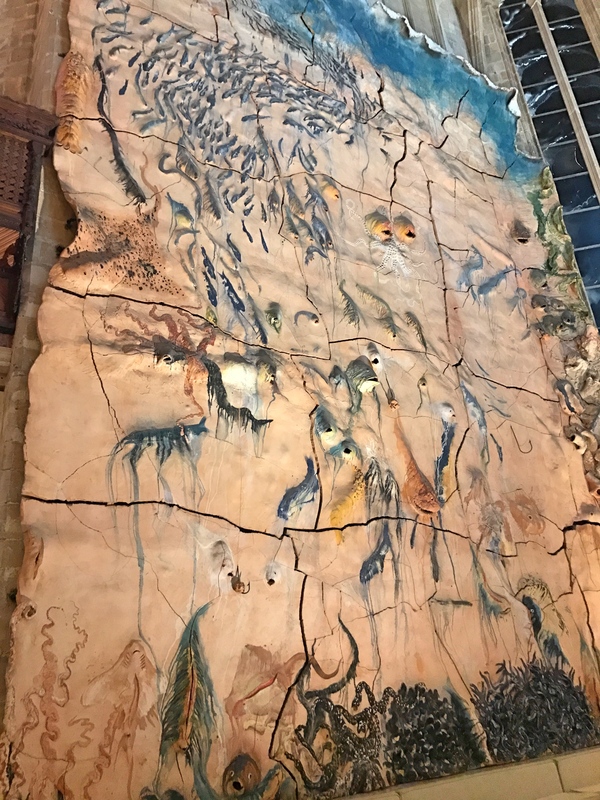 So the train station has a little museum with art by both of them. Picassos and Mirós in a train station. 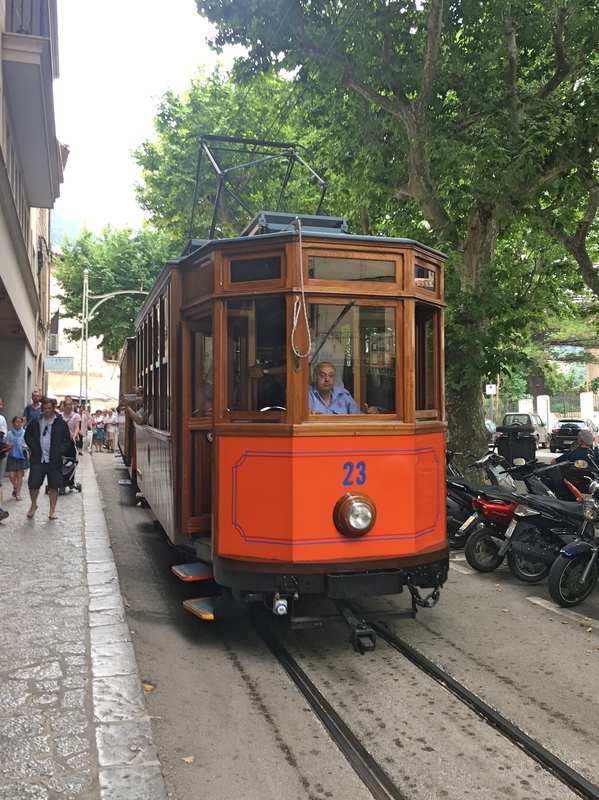 The other highlight of Sóller is the tram ride down to the port. Port de Sóller is a separate town about two miles away; it’s where you go for a (modest) beach experience and the newer hotels and restaurants are down there. You can walk there (and we did on occasion) and there are buses and taxis that go back and forth. But tourists travel by an old narrow-gauge open air tram that’s just fun to ride on. Definitely touristy and more expensive than the alternatives, but fun and pretty much worth it. Thus our first stop on Mallorca was a success. One of the things we learned here was that Mallorcans actually have their own language. It’s close to Spanish and for a while we thought it was Catalan, which was strange because this isn’t Catalonia. At some point though someone explained to Mark that Mallorcan is in fact its own beast, a separate language close to both Spanish and Catalan but also different from both, reflecting the separate history that the island has had. Maybe we’ll come back some day so Mark can study Mallorcan. 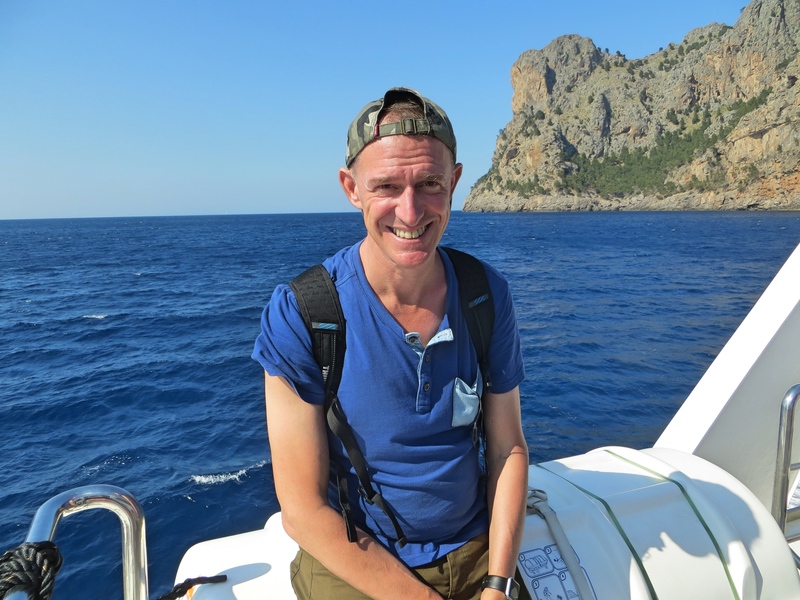 First, though, we’re off to Alcúdia up on the northern tip of Mallorca and then on to Palma, the major city.